AMENDED Review of the Freewrite by Astrohaus. Imagine if a writer like Ernest Hemingway was reanimated and thrust into today’s world. Chances are that he would see a computer and recognise the QUERTY keyboard as it’s very similar to a typewriter, then figure out that the words appear on a TV screen instead of paper. 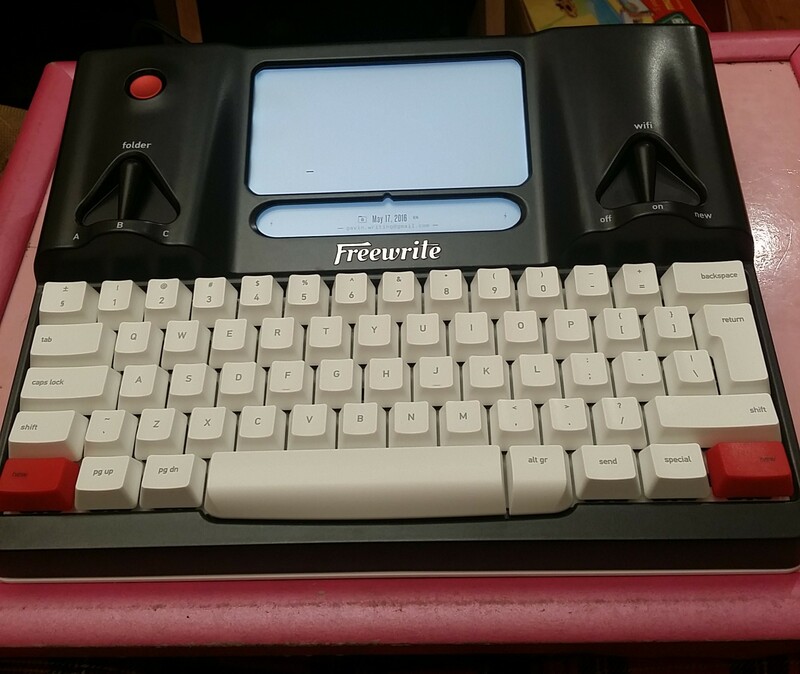 And like a typewriter, the Freewrite aims to do one task and do it well: to allow a writer to record words electronically without being distracted by the Internet or the many options of a word processing application. I was an early backer of the project; as such, Astrohaus sent my unit last week. Having had time to evaluate its features, here are my conclusions. The Freewrite is a sturdy beast weighing about 4lbs. There is no mouse, touchpad or touchscreen facility. Instead, you use the keyboard for almost every feature. Unlike a modern laptop, the keys will last longer, being a chunky Cherry design reminscient of the BBC Microsystem. They make a satisfying clackety-clack, although this also makes it too loud to use in an average library. Like a typewriter, there are also no arrow keys, only a Backspace button, plus Pg Up and Pg Dn to view previous work without editing it. It’s ideal for the writer who wants to force him- or herself to write words without worrying about editing them. Aside from the power key, there are two washing-machine-style switches: one controls the wi-fi – to back up only, not to surf the Web – and the other selects a folder so the writer can work on up to three documents concurrently. The screen is e-ink, the same technology used in a black-and-white Kindle. While a valuable battery-saver, it does take a little time to become accustomed to the inherent technical delay betwen pressing a key and seeing the character on-screen. But the Freewrite does, in some ways, feel like a prototype that’s not quite ready for mass-production. Consider the Send button, which instantly e-mails you a copy of what you’re writing. Nestled between Alt Gr and Special, it’s far too easy to hit it inadvertently and find multiple drafts in your inbox unexpectedly. The user also needs to press two buttons together to start a new note. Perhaps a similar approach to Send would save these accidental messages. As I’m British, I chose the ISO keyboard, although an ANSI version is available. That might explain why the Alt Gr button acts so inconsistently. Hold it and type ‘abcdef’ and it should show ‘æ”¢ðeđ’, but sometimes it shows nothing, and there’s no apparant explanation. AMENDED CONTENT: In the first version of this entry, I said I was also baffled why it’s so difficult to use multiple cloud services simultaneously; the Freewrite currently supports Dropbox, Evernote, and Google Drive. I use them for different purposes: the former for local document backup, the latter for online-only or collaborative documents, and the other for short reminders. However, Astrohaus responded to me that in Advanced Settings, folders A, B and C can be mapped accordingly. I’m also unable to edit any Evernote notes, as I’m told it’s ‘created in another application’. I’m aware this is the fault of Evernote, not Astrohaus. It is possible to map individual folders through the online interface Postbox, but once it’s mapped – even in error – it’s apparantly impossible to disconnect the folder unless you delete it. Can’t someone be allowed to correct a potential mistake? I would also care to see less overall reliance on Postbox; a basic setting such as font size, for starters, ought to be adjustable on the unit itself rather than through the Web. Every time the writer needs to use Postbox, it’s through a browser, and there’s a potential to be distracted – the very factor the Freewrite is trying to eliminate. It should only be neccessary to use a browser for retrieving backed-up files. The Special key is currently used only to scroll through display options. Any additional features could easily be accessed by using a Special+[button] combination. There’s a further opportunity being wasted here as well: to bring the whole experience offline if the writer chooses. The Send button might be given a secondary function of sending a draft directly to a printer, and/or backing up onto a USB stick. I’ve been struggling a little with the battery too. The Freewrite doesn’t seem to charge unless it’s switched off; other devices will charge while you’re using them, albeit more slowly. A percentage indicator showing the remaining power should be a given. For all the negative points identified, I’m nonetheless convinced the Freewrite does the one thing it set out to do and does it well: provide a distraction-free writing experience. I’m typing this entry on the machine, and I’m finding it’s already forcing me to change my style. If I notice a mistake earlier on, I’ve been making a note in square brackets, eg, [two paras up, correct ‘sending’], then moving on. It’s worth remembering that even large companies don’t always hit the mark with a new product. Early adopters of the iPhone will remember the major flaws that took a couple of versions to iron out. Similarly, the first Freewrite firmware update might solve some of the issues. I’m confident the next generation will feel less like a proof of concept and more like a replacement laptop for the serious writer, but you can buy a good Windows PC for much less than the Freewrite’s $598 (£413) price-tag. The question is whether Astrohaus can capitalise on its unique selling point and convince writers that their flagship product is the better investment. On Friday night, I was invited out to play what was described as ‘a writing game’. Faced with this offer, most normal people would perhaps turn it down; writers, on the other hand, are not normal people. It was arranged by a friend of a friend and we met in a hotel bar. I was expecting it to be like a writing class, where the leader gives you a prompt – perhaps six words, or a fragment of speech, or an old photograph – and you have five or 10 minutes to write down a passage inspired by it. You’re dealt six cards, each containing an illustration, and you have to think of a caption for it. The other players then have to guess which card was yours by the caption you gave it. If everyone guesses or nobody guesses, you don’t score any points; but if some players guess, you do. It’s a tricky balancing act between not describing the card as it is, but not being so obscure that nobody understands it. For example, I received a card depicting a maze with butterflies around it. If I’d been asked to describe this card to someone, that’s very much what I would have said. 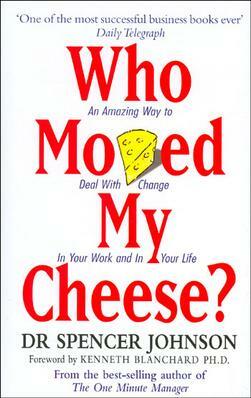 But to prevent the other players from getting too easily, I gave it the caption Who Moved My Cheese? after the business book of the same name, featuring mice who live in a maze. As it happens, none of the other players had heard of the book, so nobody guessed it. This is a principle that also applies to writing. I recently read the PD James novel The Children of Men, and I was disappointed by how often the author spelt out details that could have been shown through characters’ actions. On the other hand, I can recall several anthologies where their respective editors seemed to equate vagueness with literary worth. The stories would have a set-up, a change, then would end with insufficient details so the reader had no idea how the situation was resolved. Even stories with an open ending will generally provide enough clues for the reader to imagine which way it went once the narrative stops. I refer you to the ending of The Day of the Triffids.